All Saints is built in finest Ancaster (Lincolnshire) stone, and is roofed with tiles from Broseley in Shropshire. The approach is from the north side, facing the tower with its 120 foot spire. The tower has a porch under it leading into the nave. 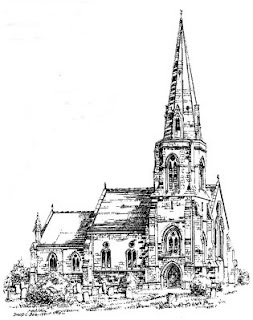 Above the porch is the octagonal belfry with its six bells "Blessing", "Honour", "Glory", "Power", "Be unto him that sitteth upon the throne" and "And unto the lamb forever", inscriptions instantly familiar to all who have heard Handel's "Messiah" (taken in turn from Revelation 7:12). 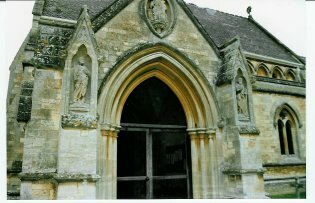 The south porch has buttresses displaying statues of four saints: flanking the door on the left and right respectively are St Peter (with his keys) and St Paul (with his sword). On the east and west buttresses are St John the Evangelist and St John the Baptist (with his camel skin cloak).On the gable above the porch is the Virgin with her Child. 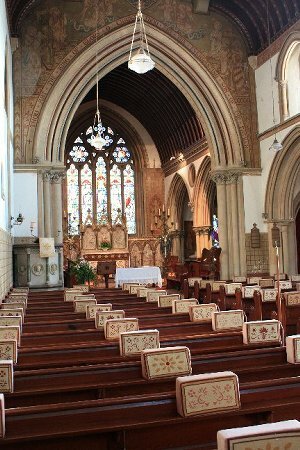 The history of Nocton Church is inextricably bound up with that of Nocton Hall, and it is inevitable that the church contains numerous monuments to residents of the Hall. To the right of the south door is the monument to Dean Henry Hobart, which portrays his wife and daughter (the latter the designer of the east window). 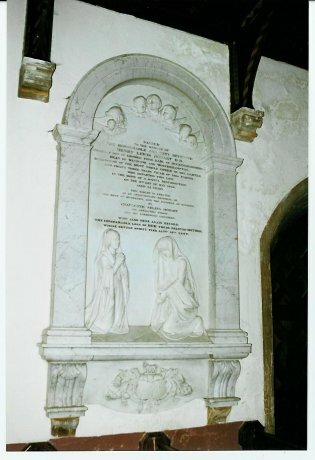 To the left is the memorial to his elder brother Robert, 4th Earl of Buckinghamshire, which was transferred from St Peter's. Robert was an eminent politician and colonial administrator, reaching the rank of Colonial Secretary. Hobart, capital of Tasmania, was founded during his tenure and is named in his honour. Because of their parents' socialising, Robert and Henry spent much time in the care of their nurse Katherine "Nanny" Field. Henry erected a memorial to her, now in the vestry and visible through the screen, "in full recollection of her kindness, care and watchful attention over him during the first ten years of his life." In the north porch is the memorial to Sir William Ellys of Nocton Hall, who was solicitor-general to Oliver Cromwell. The main memorial in the church, however, is in the mortuary chapel. This is the tomb of the Earl of Ripon, Frederick Robinson, and Lady Sarah. The Earl entered a career in politics, but this turned out to be ill-advised, "he being not endowed with either capacity or experience ... besides being disqualified for vigorous measures by the remissness and timidity of his character." He was a spectacularly unsuccessful Chancellor of the Exchequer, earning the sobriquet "Prosperity Robinson", and was no better as Prime Minister, which post he held "for five chaotic months" from August 1827 to January 1928. He was "singular among Prime Ministers in being the only one who never faced Parliament in that capacity, his Cabinet having been formed so weakly or managed so clumsily that it fell to pieces before the accustomed time of trial arrived." He made a better local land owner, though, and the village owes him a great deal. The tomb shows the Earl in marble, carved by Matthew Noble. On the wall of the chapel is a memorial to Eleanor, daughter of Frederick and Sarah Robinson, who died aged 11, and her baby brother Hobart Frederick, aged two days. The east window of the chapel, again designed by Miss Hobart, commemorates her sisters Albinia Mary, aged 16, and Maria, aged 30 (with her baby, who barely outlived her).